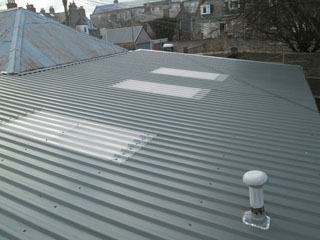 We provide top quality steel box profile sheets and flashing. Both of the above roofing would be expected to last for around 40 plus years, when fitted correctly. There are a wide choice of colours available, colour chart available on request. 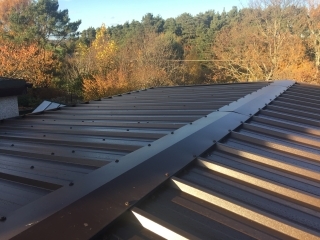 As a company we have completed many different jobs using metal sheeting such as, farm buildings, car showrooms, commercial garages and garden sheds. These jobs were all finished to a high standard, never cutting corners and ALWAYS working to a very high standard. Customer satisfaction is very important to us. Composite panels are a solid, rigid panel made from sprayed insulation and inserted between galvanised plastic covered metal box profile sheets. There are various thicknesses available, from 40mm to 160mm thick insulation. These composite panels are a popular choice for industrial buildings such as car showrooms and garages, as it meets with modern building requirements. It is also very good at reducing heating costs and gives your building a clean and fresh look. We all know that asbestos has gained a bad name for itself over the years as a hazardous material, but we have been dealing with various asbestos roofing for a very long time. Asbestos cement is a mixture of cement and asbestos, about 10-15% in total. It may have white asbestos (chrysolite) or old asbestos cement may have brown (crocidolite) or blue (amosite). When stripping asbestos cement there isn’t a big risk, if the cement is removed correctly. All of our roofers have been fully trained in non-licensed asbestos works, and have the experience to work with asbestos to comply with HSE for asbestos cement removal. For further information, give us a call today on 01542 833 501. You can also reach us through the contact us page.